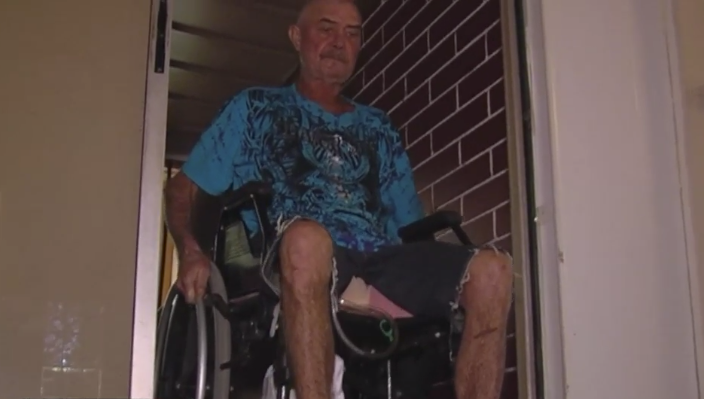 He was brutally beaten and then run over with his own truck after getting carjacked, but Harry Swift is now out of the hospital and recovering at home. VERO BEACH, Fla. - He was brutally beaten and then run over with his own truck after getting carjacked, but Harry Swift is now out of the hospital and recovering at home. Wincing in pain, Swift struggles to move from the couch to his wheelchair. "It's very difficult, I can't work of course and it's very painful," Swift said of the attack that left him in the intensive care unit for a week, and a month in the hospital. Swift is on the road to recovery, but it's been a bumpy one. "I got a rod that runs through the front of both sides and all the way through," Swift said, as he nurses a shattered pelvis. The 50-year-old was heading out to buy a pack of cigarettes when he was carjacked and viciously attacked outside the BP gas station at 43rd Avenue and State Road 60 in Vero Beach on January 24th. "They started beating me up and then hit me in the back of the head with the gun, which split my head open, and then threw me under the truck and ran me over," Swift recalled. Swift's truck was abandoned less than a mile away. It's now back in his driveway, but he's not able to get behind the wheel. The Indian River County Sheriff's Office says the suspects didn't know Harry, and believe they were out for a joyride. "They were a lot younger, a lot faster, and there wasn't much I could do about it because they caught me off guard," he said. Last week, the sheriff's office announced forensic evidence led them to a 15-year-old, who was arrested and charged as a juvenile with aggravated battery with a deadly weapon and carjacking with a deadly weapon. "It makes me sick that it was so young, but I'm so happy that he was caught," said Cheyenne Swift, Harry's wife. As Swift continues rehab, he's hoping whomever was behind the attack will pay for the cruel crime. "I wish he would get caught because it won't make me feel right if they don't catch him," said Swift, who is set to have another surgery next month. The sheriff's office says it is still investigating a second suspect.